Not only can bacteria cause gum disease and contribute to tooth decay, it can also inhibit healing. 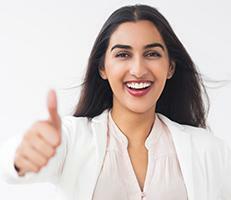 At Kathy Zahedi, DDS & Associates in Santa Monica, California, Dr. Zahedi offers ozone dentistry to kill bacteria, reduce pain and inflammation, and ensure optimal dental healing and health. If you’re experiencing toothache, gum disease, or jaw pain, call or book an appointment online today. Medical-grade ozone is a highly reactive form of oxygen that triggers a healing response in your body and can be used as a natural antibiotic. Dr. Zahedi uses ozone in dental care as an anti-inflammatory and disinfectant to kill bacteria, virus particles, fungi, and parasites. Ozone also improves blood circulation and supply, induces a general feeling of wellness, and clears away hard-to-reach infections, such as those in deep pockets of gum tissue. How does ozone dentistry work? Dr. Zahedi uses an ozone generator to convert pure oxygen into ozone. When applied to your gums or teeth, the ozone attaches to the wall of a diseased cell. Bacteria are not resistant to ozone and have a positively charged exterior cell wall; the negatively charged ozone particles naturally attack and kill the harmful bacteria. Ozone also increases your body's production of cytokines. Cytokines are chemical messengers made by white blood cells to attract immune support. Ozone stimulates antioxidant molecules, which can alleviate autoimmune diseases. Ozone therapy is noninvasive and has little to no long- or short-term side effects. What dental conditions can ozone therapy improve? she removes the diseased or infected tissue at the center of your tooth. If you’re experiencing any of these conditions, Dr. Zahedi reviews your medical history and evaluates your symptoms and overall health to determine whether ozone therapy may be right for you. Call Kathy Zahedi, DDS & Associates or book an appointment online today to find out if ozone therapy is right for you.